The New York Times said Johnson Cano's "voice seems to come out of a happy nexus of heart, soul and brain..."
Webster University alumna Jennifer Johnson Cano '06 is featured on a major new CD release from the international music label Naxos. 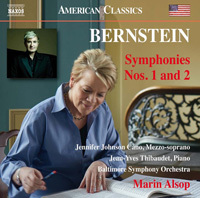 The new disc features the Baltimore Symphony Orchestra, led by Marin Alsop, conducting two seminal orchestral works by Leonard Bernstein (1918-1990). Also on the disc is French superstar pianist Jean-Yves Thibaudet. Cano is a native of St. Louis, Missouri and made her professional operatic debut with the Opera Theater of St. Louis, which is located on the home campus of Webster University. After undergraduate study, she earned her graduate degree from Rice University. She recently sang, by invitation, at the private funeral for pioneering American astronaut Neil Armstrong. Her first solo disc, a recital from the Savannah Voice Festival, is available on Amazon and iTunes.